We supply LC fiber optic pigtails, with very competitive prices. We offer 3 primary fiber versions including the 9/125um single mode, 62.5/125 multimode and 50um OM3 10Gb types, These fiber pigtails are with premium grade LC connectors and with typical 0.9mm outer diameter cables. Simplex fiber pigtail and duplex fiber pigtails are available, with different cable color, cable diameter and jacket types optional. 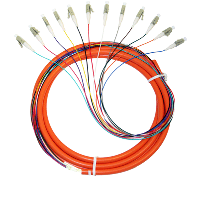 The most common is know as the fusion splice on pigtail, and the 12 fiber or 6 fiber multi color pigtail are easy to install and provide a premium quality fiber optic connection. We also offer Individual single pigtails, Discounted 6 packs, or 12 Packs. Also are 12 fiber or 6 fiber jacketed pigtails .